Lycos Search offers a comprehensive suite of tools that helps millions of people find whatever they're looking for, from traditional web results to video, images, shopping deals, and more. Due to the number of different browsers we have provided instructions on setting Lycos as your default search provider in each major browser. Begin by navigating to the search preferences page in FireFox. 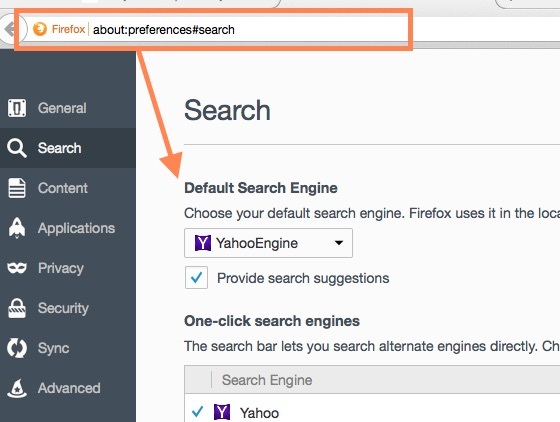 Enter about:preferences#search into the address bar of Firefox. Click the drop down menu to display the available search providers. Click Lycos Search at the bottom to enable Lycos Search as the default provider. 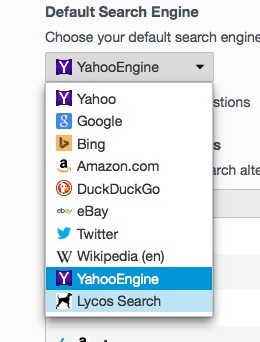 Firefox will new use Lycos Search as its default search provider. Thanks again for choosing Lycos! Begin by navigating to the searchg engines modal window in Chrome. Enter chrome://settings/searchEngines into the address bar of Chrome. Scroll down the list of 'Other Search Engines' until you find Lycos Search. Hover over the item and click the button Make Default to enable Lycos Search as the default search engine. Google Chrome Omnisearch Bar will new use Lycos Search as its default search provider. Thanks again for choosing Lycos! In order to use Lycos as the default provider on newer versions of Internet Explorer you have to install it from Edge Gallery. Unfortunately the Edge Gallery is no longer accepting new submissions. Thank you for your understanding.